On 18th October 2006, episode one of a new language-learning podcast called Coffee Break Spanish was released to the world. This show was a bit different from the other Spanish learning shows out there: it was a gradual introduction to basic Spanish presented by teacher Mark, teaching student Kara. At this stage no-one really knew if the idea would work, but Coffee Break Spanish grew to become one of the most popular ways to learn Spanish online. The show quickly climbed the charts on iTunes UK and US, and began to feature in the top podcasts at Podcast Alley and on Libsyn. Three years down the line and the Radio Lingua Network now produces twenty-seven language courses in eighteen languages and this week saw the sixty millionth download of our language lessons! That means – on average – around 55,000 downloads per day, every day for the last three years. 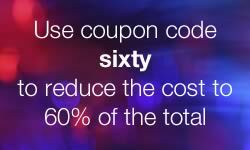 To celebrate this milestone in our company’s development, we’re reducing everything to 60% of the normal prices, ie. 40% off, for one week only, from noon GMT on 18th October through to midnight GMT on 25th October. There has never been a better time to purchase our lesson guides, enhanced podcasts and extra listening materials. Simply use coupon code sixty when you sign up for any of our shows. You can choose between Coffee Break Spanish, Coffee Break French and Show Time Spanish, or indeed one of our shorter One Minute or TwitterLearn courses. By purchasing a membership you can access a range of materials including pdf lesson guides featuring the words and phrases included in each lesson, enhanced podcasts which are perfect for listening on the iPod Touch or iPhone where you can see the flashcards synchronised to the audio, and bonus listening materials to help you improve your language skills even more. Please note that the coupon code can’t be used in conjunction with any other offer and is limited to one purchase per member. Please note too that in order to qualify for the discount, the coupon code must be used at checkout time. We can’t offer retrospective discounts if the coupon code was not used. We’ve been reading your comments regarding discussion boards and building a community around our lessons. Our previous discussion boards were created before we developed our membership system, so were unfortunately not linked to the system. Today we’re launching our new Community area where listeners can interact with each other, share their language-learning experiences and benefit from collaborative learning with fellow listeners. Accessing the Community is free, but you’ll need to sign up for an account in our system, so we’ll hopefully avoid the spam problems we’ve had in the past. If you’re already a member of our system then you’ll be able to access My Courses in the community, where we’ll lead activities and generate discussions in which you can practise what you’ve learned in each lesson. My Courses is restricted to our premium members, so if you’ve purchased a Season Pass to Coffee Break French Level 2, you’ll see this course in My Courses, allowing you to interact with your fellow learners in the activities and discussions there. And if you’re not yet a premium member, you can join this week at a hugely discounted price! We’re looking forward to interacting with all our learners in My Courses. Any questions? Get in touch with us, or post your question in our Community area. Here’s to many more years of language learning with Radio Lingua! Enhorabuena Radio Lingua! Your Spanish programs have made learning quite fun. I look very forward to each new podcast and in fact am about to become a paid member. Saludos desde MADRID :-)). I’ve only just heard this podcast and I’ve missed the week’s special offer 🙁 this is a fantastic way to learn a language. well done everybody!